SQ Group has partnered with Mercer Consulting – the No. 1 HR Consulting Company in the world – to transform its organizational HR practices. To embolden and move forward with the partnership, SQ Group and Mercer Consulting signed an agreement. According to the agreement, over a period of approximately six months, Mercer will redesign HR practices in such a way that builds right organization culture, drives performance orientation, motivates and keeps employees engaged, and ultimately achieves business priorities and targets. 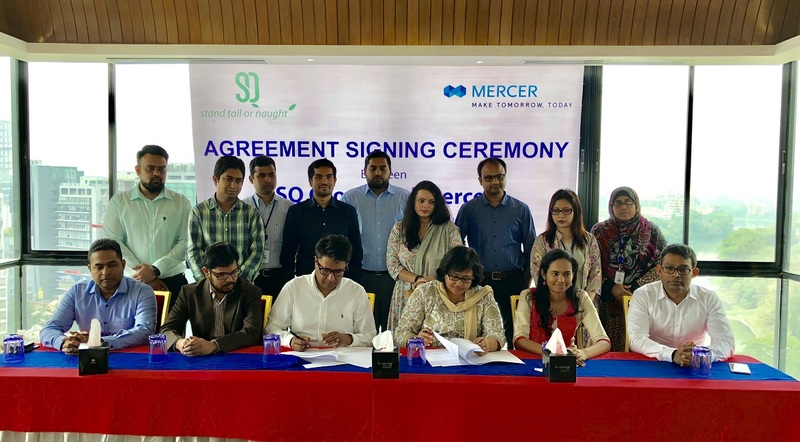 Mr. Warisul Abid, Chief People Officer, SQ Group and Ms. Nilanjana Dutta, Associate, Mercer Consulting signed the agreement. Mr. Johan Ahmed, Deputy Chief People Officer, SQ Group and Ms Nivedita Balgi, Associate, Mercer Consulting along with other high officials of SQ Group were also present in the signing ceremony.